The legendary Beach Boys defended their long-standing brand, winning the UDRP for the domain BeachBoys.org. Registered in 2002, the domain is owned by a British tribute band called Good Vibrations – another smash hit by the Beach Boys. What an awkward moment it must have been, as the British band used the domain BeachBoys.org, along with Surfin-USA.co.uk, to promote their gigs. The Respondent is David J. Roberts of Good Vibrations, which is a The Beach Boys tribute band based in the United Kingdom. The Respondent registered the Disputed Domain Name on May 14, 2002. The website at the Disputed Domain Name promotes the Respondent’s services. According to the Complaint, the Complainant and the Respondent have recently engaged in discussions regarding the Respondent’s use of the Disputed Domain Name. The Respondent had agreed to make clear that the website at the Disputed Domain Name related to a tribute band which was not affiliated with The Beach Boys. The Complainant agreed to allow the Respondent to register the domain name <beachboystributeband.org> in exchange for the transfer of the Disputed Domain Name. However, the Respondent refused to transfer the Disputed Domain Name without payment by the Complainant, and has continued to use the Disputed Domain Name. With all that in mind, the sole panelist at the WIPO ordered the domain BeachBoys.org to be transferred to the Complainant. So help me Rhonda! The Complainant is Brother Records, Inc. of Beverly Hills, California, United States of America (“United States”), represented by Fulwider Patton LLP, United States. The Respondent is David J. Roberts, Good Vibrations of Bristol, United Kingdom of Great Britain and Northern Ireland (“United Kingdom”). The disputed domain name <beachboys.org> (the “Disputed Domain Name”) is registered with Tucows Inc. (the “Registrar”). The Complaint was filed with the WIPO Arbitration and Mediation Center (the “Center”) on November 17, 2017. On the same date, the Center transmitted by email to the Registrar a request for registrar verification in connection with the Disputed Domain Name. On November 20, 2017, the Registrar transmitted by email to the Center its verification response confirming that the Respondent is listed as the registrant and providing the Respondent’s contact details. In accordance with the Rules, paragraphs 2 and 4, the Center formally notified the Respondent of the Complaint, and the proceedings commenced on November 24, 2017. In accordance with the Rules, paragraph 5, the due date for Response was December 14, 2017. The Respondent did not submit any response by that date. Accordingly, the Center notified the Respondent’s default on December 15, 2017. On December 20, 2017, the Center received an informal email communication from the Respondent. The Center appointed John Swinson as the sole panelist in this matter on December 27, 2017. The Panel finds that it was properly constituted. The Panel has submitted the Statement of Acceptance and Declaration of Impartiality and Independence, as required by the Center to ensure compliance with the Rules, paragraph 7. The Complainant is Brother Records, Inc., a recording company which owns intellectual property rights relating to the famous rock band “The Beach Boys”. According to the Complaint, The Beach Boys is one of the most famous bands in the world. The band has been performing and recording music for over 50 years. Through the Complainant’s successful marketing and promotion of The Beach Boys, the band is one of the most commercially successful and influential bands of all time, and fans have come to associate The Beach Boys with the Complainant. The Complainant estimates that The Beach Boys’ record sales have reached between 100 and 350 million records worldwide. The Complainant owns a number of registered trade marks for THE BEACH BOYS (the “Trade Mark”), the earliest of which appears to have been registered on January 3, 1978 (United States registered trade mark number 1,081,112). The Complainant makes the following contentions. The Disputed Domain Name is identical or confusingly similar to the Trade Mark. The Disputed Domain Name fully incorporates the Trade Mark, but without the prefix “the” Given the Disputed Domain Name is similar to the Trade Mark, and the Respondent offers identical services to those offered by the Complainant under the Trade Mark, the deletion of the word “the” in the Disputed Domain Name is inconsequential. The Complainant has no relationship with the Respondent. The Complainant has not authorized the Respondent to register or use the Disputed Domain Name. To the Complainant’s knowledge, the Respondent is not commonly known by the Disputed Domain Name or the Trade Mark. The Respondent is trading off the Complainant’s reputation in the Trade Mark by offering competing services via the website at the Disputed Domain Name. The Respondent is using the Disputed Domain Name to intentionally attempt to attract, for commercial gain, Internet users to its website by creating a likelihood of confusion with the Trade Mark. This is evidence of bad faith under paragraph 4(b)(iv) of the Policy. The Respondent registered the Disputed Domain Name with prior knowledge of the Complainant and the Trade Mark. This is clear from the fact that the Respondent is a tribute band to The Beach Boys. The Respondent is intentionally using the Disputed Domain Name to divert Internet users seeking the Complainant with the hope of increasing Internet traffic to the Respondent’s website and increasing the value of the Disputed Domain Name. The Respondent clearly intends to make a commercial gain by diverting customers of the Complainant and fans of The Beach Boys to its own website. The Respondent is also using the Trade Mark in the Disputed Domain Name to frustrate the Complainant’s business, which is evidence of bad faith under paragraph 4(b)(iii) of the Policy. The Disputed Domain Name creates initial interest confusion. Although the website at the Disputed Domain Name contains a disclaimer, the initial interest confusion has already occurred. See Mahamayavi Bhagavan “Doc” Antle v. Domains by Proxy, LLC / Carole Baskin, Big Cat Rescue, WIPO Case No. D2014-1793; Red Bull GmbH v. Paul Battista, WIPO Case No. D2010-0353. The Complainant’s fans will be diverted to the website at the Disputed Domain Name. The Respondent did not formally reply to the Complainant’s contentions. However, on December 20, 2017, the Center received an email communication from the Respondent in which the Respondent stated that it had owned the Disputed Domain Name since May 14, 2002, and that the website at the Disputed Domain Name had never given any indication that the tribute band was connected with the original artists. The Respondent also stated that it now owns the domain name <surfin-usa.co.uk>, and will be shutting down the website at the Disputed Domain Name, but keeping the Disputed Domain Name with a link to the new website. The onus of proving these elements remains on the Complainant even though the Respondent has not filed a formal Response. The Respondent’s failure to file a formal Response does not automatically result in a decision in favor of the Complainant (see, e.g., Airbus SAS, Airbus Operations GmbH v. Alesini Pablo Hernan / PrivacyProtect.org, WIPO Case No. D2013-2059). The Disputed Domain Name incorporates the Trade Mark with the prefix “the” omitted. This omission does not prevent a finding of confusing similarity under this element as the Trade Mark is recognizable within the Disputed Domain Name (see section 1.7 of the WIPO Overview of WIPO Panel Views on Selected UDRP Questions, Third Edition (“WIPO Overview 3.0”)). The Panel finds that the Disputed Domain Name is confusingly similar to the Trade Mark. The Complainant succeeds on the first element of the Policy. – The Respondent has not used the Disputed Domain Name in connection with a bona fide offering of goods and services. While the Panel does no doubt that the Respondent is a legitimate tribute band, the Respondent’s use of the Disputed Domain Name in connection with those services is not bona fide. 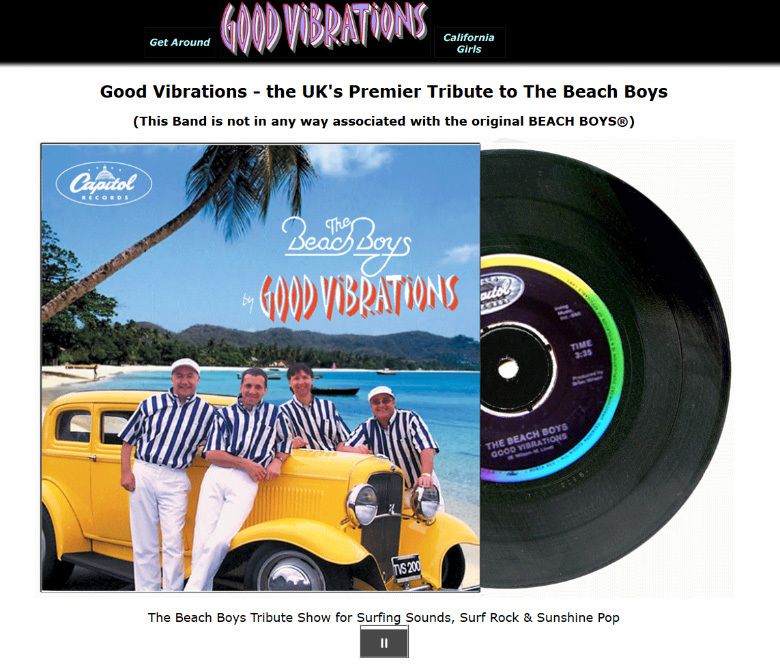 As submitted by the Complainant, the Respondent’s use of the Trade Mark in the Disputed Domain Name is, on balance, likely an attempt by the Respondent to divert Internet users seeking a website relating to The Beach Boys to the Respondent’s website. As the Respondent’s use of the Trade Mark in the Disputed Domain Name is unauthorized, in these circumstances, such use cannot be considered bona fide. – The Respondent is not commonly known by the Disputed Domain Name. While the Respondent is a tribute band that plays songs for which The Beach Boys are famous, it is commonly known as Good Vibrations. – The Respondent has not been making a legitimate noncommercial or fair use of the Disputed Domain Name without intent for commercial gain. The website at the Disputed Domain Name cannot be likened to a fan site, the operation of which may confer rights or legitimate interests. Instead, the website at the Disputed Domain Name promotes a tribute band which is operating for commercial gain. In such circumstances, the use of the Trade Mark in the Disputed Domain Name is not legitimate. See section 2.7 of the WIPO Overview 3.0. – The Respondent stated in an email to the Center that it will be shutting down the website at the Disputed Domain Name. The Respondent did not attempt to rebut the prima facie case. While the Panel considers that it would be clear to some Internet users upon accessing the website at the Disputed Domain Name that the Respondent is a tribute band and is not associated with The Beach Boys, the use of the Trade Mark in the Disputed Domain Name creates an implied affiliation with the Complainant. This use is gratuitous. The Respondent could have selected another term which would not have carried the same implied affiliation, and which made the Respondent’s position as a tribute band more clear from the outset (and has apparently done so recently with the registration of <surfin-usa.co.uk>). See section 2.5 of the WIPO Overview 3.0. Based on the above, the Panel considers that the Respondent has no rights or legitimate interests in the Disputed Domain Name. The Complainant succeeds on the second element of the Policy. Paragraph 4(a)(iii) of the Policy provides that the Complainant must establish that the Respondent has registered and is using the Disputed Domain Name in bad faith. As the Respondent is a tribute band for The Beach Boys, it is clear that the Respondent registered the Disputed Domain Name with the Trade Mark in mind. The Respondent’s likely intention was to attract Internet users who are fans of The Beach Boys to the Respondent’s website at the Disputed Domain Name. As discussed above in relation to the second element of the Policy, despite the disclaimer appearing on the website at the Disputed Domain Name, the Respondent’s use of the Trade Mark in the Disputed Domain Name creates an implied affiliation with the Complainant. The Panel considers that, by registering and using the Disputed Domain Name, the Respondent is intentionally attempting to attract, for commercial gain, Internet users to its website by creating a likelihood of confusion as to the source, sponsorship or affiliation that website or its services (see paragraph 4(b)(iv) of the Policy. The Respondent had the opportunity to establish its good faith use of the Disputed Domain Name, but chose not to do so. The Complainant succeeds on the third element of the Policy. For the foregoing reasons, in accordance with paragraphs 4(i) of the Policy and 15 of the Rules, the Panel orders that the Disputed Domain Name <beachboys.org> be transferred to the Complainant.